In theory, a grill is a simple way to cook over an open fire. The fire, whether derived from burning charcoal or gas is what does the cooking. It can be intense in heat or it can be held low for slower roasting, but the limitation is that the transfer of heat is slower than in other forms of cooking. With a grill, hot air does most of the work. When boiling food (which I advise against in all cases), it is hot water. Sautéing in a pan uses the heat of metal to cook food. The heavier and more solid the pan, the more heat it can hold to transfer. No pan is heavier than cast iron, which is what makes it perfect for cooking. An added bonus is that cast iron imparts nutritional iron to foods as well. Whether it is a cheap grocery store grill or an expensive monster, all grills can use a little help getting more heat into foods. While many grills, particularly of the gas variety, can struggle with even cooking temperatures, cast iron’s ability to absorb and distribute heat makes it the perfect solution. Place a heavy cast iron skillet or griddle directly over the flame and let it heat up for ten minutes. The fire can be adjusted to high or low. The cookware will reach that temperature and hold it for long periods of time. Skillets, in particular, can be easily moved away from the direct heat source to indirect cooking, giving the ability to do both high and low-temperature cooking. When it comes to many cuts of meat, the best cooking process is a combination of high and low-temperature cooking. The high-temperature blast sears and caramelizes the surface, giving it the perfect crusting that provides the combination of textures. The low-temperature cooking period allows meats to be cooked through to the desired doneness. This type of cooking is perfect for almost any cut, but chops and steaks in particular. It is also a fantastic way to make the perfect burger. The high-temperature phase can be done at the beginning of the cooking time or at the end. In the case of the later, we call this reverse searing. Meats warm through at a lower temperature and then finish over an intense heat. Grilling is great, unless the food being cooked is small or delicate. Fish and seafood, as well as vegetables, can be a challenge. Using a cast iron pan or griddle will alleviate these problems. Whether a high direct heat or a low indirect heat, placing a cast iron pan on the grill provides the space to safely hold these more troublesome foods. This is also a perfect solution for grill items that might need a sauce. Imagine a shrimp scampi for instance. Shrimp fall through the cooking grate unless placed on skewers, but in a cast iron skillet the whole dish can be prepared in minutes with no worries, and a pair of steaks can be grilling next to it for a perfect surf and turf meal. 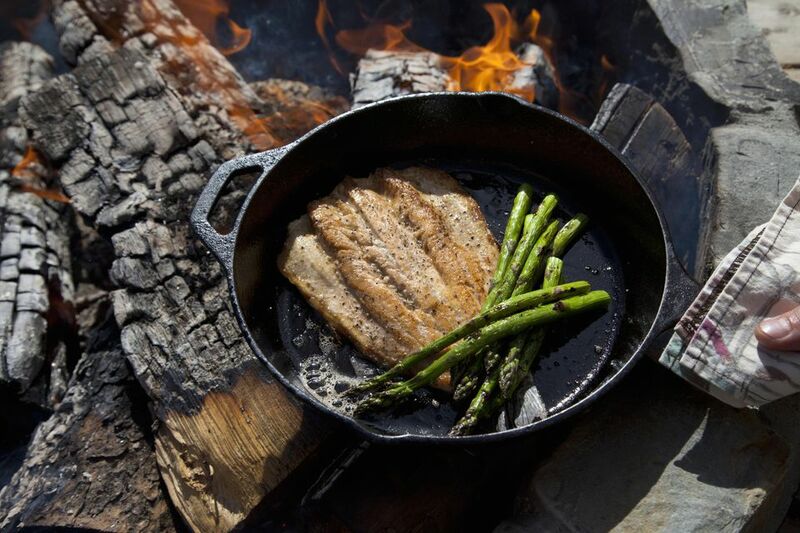 Setting a piece of cast iron cookware on the edge of the grill, as far from the heat as possible provides for the perfect space to keep foods warm. The pan will remain hot, but so hot that it will burn foods. When cooking a wide range of items, or doing a large amount of any one thing, this space is perfect safe space for holding foods at temperature while the rest of the meal comes together. To prevent these items from drying out, keep a carton of broth handy and pour in small amounts to keep foods moist. Cast iron does require care. An important thing to remember is that in high temperature cooking, the oils in the metal that prevent rusting can break down and expose the bare metal. Once your cast iron cookware has had a chance to cool, inspect it for dry and exposed patches. These will need additional oiling after cleaning. This is particularly true of the bottom sides of pans and griddles that have the most heat exposure. Cast iron cookware that is cared for will last many lifetimes. Cleaning cast iron is easy. Please don’t listen to those that say to just wipe it clean. Cast iron needs to be thoroughly washed so that the next dish doesn’t taste like the last one. Avoid harsh detergents, but use soap as needed to get the surface clean. The oil embedded in the metal will remain. Once cleaned and dried, rub a small amount of high-temperature oil into the metal to prevent rusting. A well-preserved piece of cast iron will appear shiny, but not oily. The last note is to be careful. On the grill, cast iron can become extremely hot. The average kitchen hot pad or towel will not protect hands from this kind of heat. Leather grilling gloves will help, but several layers might be needed to prevent injury. It is best to leave hot cast iron where it is and give it a chance to cool down before handling.